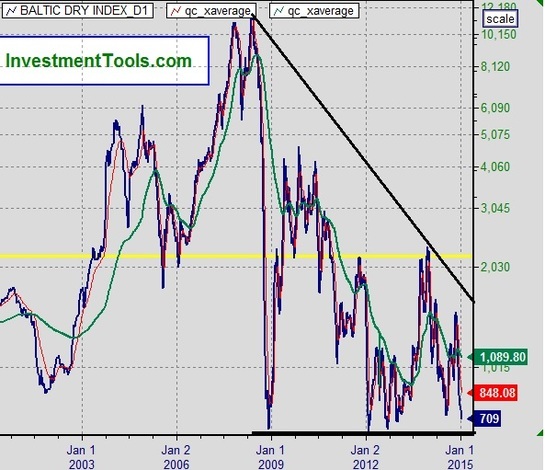 Are the Baltic Dry Index Telling Us to Expect a Weaker Stock Market ? The Baltic Dry Index is a shipping price index created by the London based Baltic Exchange. ​​It measures changes in prices of transporting dry bulk cargo such as grain, cocoa, phosphates, fertilizers, animal feed, oil, coal, iron ore and metal by sea. ​​The Baltic Dry Index is calculated by taking the time charter components of the Baltic’s capesize, panamax, supramax and handysize indices (Baltic Exchange). ​​The Baltic Dry Index is considered an excellent gauge of global trade. The Baltic Dry Index measures the demand and supply of dry bulk shipping capacity. An increase in demand for dry bulk shipping capacity indicates growth in trade of bulk cargo which is often raw material for intermediate or finished goods. This points to growth in consumption and general economic health. ​​The Baltic Dry Index is considered an impartial leading indicator (predictor of future economic activity) because it is free from speculation. Nor is it subject to many adjustments and revisions. 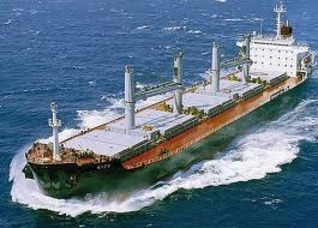 The Baltic Dry Index indicates the real demand and supply for dry bulk cargo space. Only those who have cargo to ship will buy space and anyone with the available space would supply it because it’s very costly to keep an idle ship. On a shorter term basis, as each end of the year were we can see a huge correction ( driven by seasonality factors ) and there after a grind back starting in February of each year.